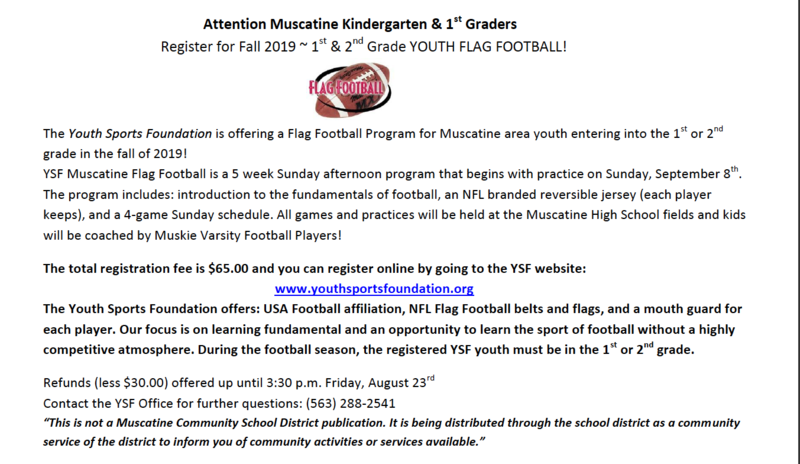 The Youth Sports Foundation is offering a Flag Football Program for Muscatine area youth entering into the 1st or 2nd grade in the fall of 2019! YSF Muscatine Flag Football is a 5 week Sunday afternoon program that begins with practice on Sunday, September 8th. The program includes: introduction to the fundamentals of football, an NFL branded reversible jersey (each player keeps), and a 4-game Sunday schedule. All games and practices will be held at the Muscatine High School fields and kids will be coached by Muskie Varsity Football Players! The total registration fee is $65.00 and you can register online by going to the YSF website: www.youthsportsfoundation.org The Youth Sports Foundation offers: USA Football affiliation, NFL Flag Football belts and flags, and a mouth guard for each player. Our focus is on learning fundamental and an opportunity to learn the sport of football without a highly competitive atmosphere. During the football season, the registered YSF youth must be in the 1st or 2nd grade.